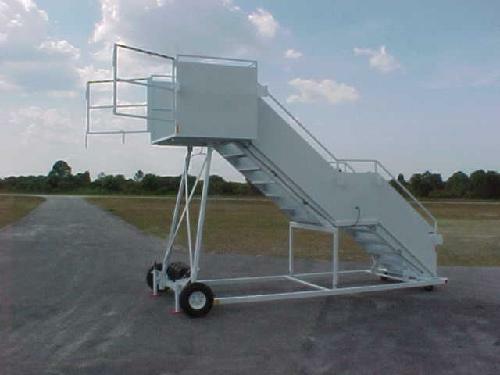 The Phoenix PLBS 96AE is a fixed passenger stair designed to be used at a passenger loading bridge to transport passengers from ramp level to terminal entry. The PLBS 96AE is lighted for night operations. The platform has safety gates to secure the opening at the loading bridge bumper. The stair has two adjustable stabilizers in the front and two fixed stabilizers in the rear. The front has 5.70 x 8� pneumatic wheels and the rear is 7� swivel casters. The stair is light enough for two people to easily maneuver. The stair treads and platform are aluminum diamond plate.